HONG KONG – Asian stock markets surged Tuesday, with Japan's key index jumping nearly 5 percent, after Wall Street staged a massive rally as news that Citigroup is turning a profit buoyed hopes the stricken financial sector can recover. The region's lurch higher, led partly by financial shares, was a welcome reprieve from the depressing declines in global equities over the last few weeks. But analysts said the relief was likely to be temporary as stocks, in the throes of the worst bear market in years, continue to grind toward a new bottom in the coming months amid the worsening outlook for the world economy. Another sharp drop in Chinese exports last month was just the latest grim reminder of how severe the global downturn is. "What you've seen today is mostly a technical bounce in markets after falling steeply recently, and I don't think this rally can be sustained," said Arjuna Mahendran, the Singapore-based head of Asian investment strategy for HSBC Private Bank, which manages some $494 billion in assets. "It's still far too early to predict that the global recession is over ... The fundamentals are simply not in place." The catalyst for the rally on Wall Street was a letter from Citigroup Chief Executive Vikram Pandit to employees saying the bank had operated at a profit for the first two months of this year, logging its best performance since the third quarter of 2007, the last time it booked a quarterly profit. Investors, desperate for any positive signs about the ailing financial system, cheered the news about the banking giant, which has lost so much money the federal government has been forced to extend billions in aid and take a 36 percent stake. Japan's Nikkei 225 stock average shot up 321.14 points, or 4.6 percent, to 7,376.12, rebounding from a 26-year closing low hit this week. Hong Kong's Hang Seng leaped 332.56 points, or 2.8 percent, to 12,026.61. Elsewhere, South Korea's Kospi rose 35.31, or 3.2 percent, to 1,127.51. Benchmarks in Australia, Singapore and Taiwan were up 1.9 percent. Banking shares were especially strong, with leading Japanese bank Mitsubishi UFJ Financial Group Inc. gaining 4 percent. HSBC, which like Citi gave reassurances this week that it was performing better than expected so far this year, advanced 6 percent in Hong Kong, continuing its recovery form a 24 percent plunge on Monday. The upbeat mood, though, belied more evidence that Asian countries were still suffering from the drought in Western demand that drives their export-reliant economies. In China, exports plunged 25.7 percent last month as overseas appetites for goods made in the world's third-largest economy continued to deteriorate. Imports also fell. A string of monthly export declines is undermining hopes among many investors that China can boost its economy, at least in the near term, with a 4 trillion ($586 billion) stimulus package. Also in Asia, Japanese machinery orders, an indicator of how much the country's companies are spending, fell 3.2 percent in January, though were still better than expected. In the U.S., Federal Reserve chairman Ben Bernanke warned the U.S. recession wouldn't end this year unless the government bailout of banks succeeded and financial markets were restored to working order. On Tuesday, Wall Street posted its best performance of the year, with the Dow Jones industrials surging 379 points, or about 5.8 percent, to 6,926.49. 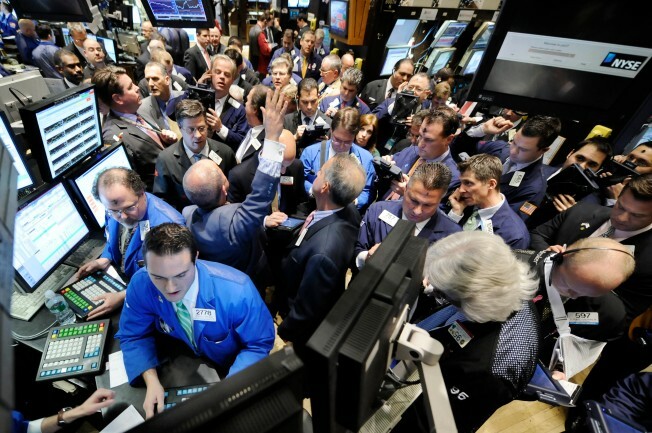 The broader Standard & Poor's 500 index advanced 43.07 points, 6.4 percent, to 719.6. Stock futures pointed to modest gains on Wall Street Wednesday. Dow futures rose 46, or 0.7 percent, to 6,933 and S&P 500 futures advanced 4.5, or 0.6 percent, to 720.50. Oil prices were steady in Asian trade, with light, sweet crude for April delivery up 5 cents at $45.76 a barrel on the New York Mercantile Exchange. The contract fell $1.36 to settle at $45.71 a barrel overnight. The dollar weakened to 98.54 yen from 98.80 yen late Tuesday. The euro dropped to $1.2629 from $1.2702.